Elizabeth Stockdale Wilkinson was an early Daguerreotype photographer with attributed work estimated to circa 1840. Born on 17th June 1799 , daughter of industrialist William Wilkinson (c.1744-1808) and Elizabeth Stockdale (b.1761), Elizabeth was related to some of the greatest leaders of the Midlands Enlightenment. 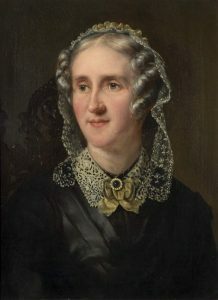 Following the marriage of her sister Mary Ann Wilkinson to Matthew Robinson Boulton in 1817 she became a member of the extended Boulton family of Soho, and was also the niece of dissenting scientist and theologian Joseph Priestley. On the early death of her sister in 1829, Elizabeth took over the primary care of Matthew Robinson Boulton’s younger children. Mary Ann Boulton, the youngest of seven, was to benefit from the attention of “Aunty Bessy”, joining her aunt in a love of photography. Elizabeth Stockdale Wilkinson’s contribution to photography was highlighted in 1863 during an investigation into claims that photography had been practiced in the late 18th century by members of the Lunar Society at Soho in Birmingham. The library at Soho House had been used as a studio by “Miss Wilkinson” and items resembling Daguerreotype images were subsequently discovered in the 1860s. This discovery was discussed by the members of the Photographic Society in June and November 1863, reported in The Photographic Journal issues no. 134 and 139. Elizabeth’s nephew Matthew Piers Watt Boulton conducted a rigorous investigation into the claims of pre-1800 photographic activity at Soho. These he identified as mechanical reproductions of paintings introduced by his grandfather Matthew Boulton and his business partner, artist Francis Eginton. Three examples are held by the Science Museum, Science & Society Picture Library. He also investigated claims that Elizabeth Wilkinson produced photographs by means of a camera lucida in 1825 but found these to be untrue. MPW Boulton also deduced that two “metal plates” found in the Soho House library were, in fact, Daguerreotypes. He wrote, “Miss Wilkinson received instructions in photography from two gentlemen resident near Soho, Mr Murdock and Mr Alston. These gentlemen made Daguerreotypes and Miss Wilkinson also made a few”. Matthew Piers Watt Boulton also considered that a report of Elizabeth using a camera obscura in 1835 to produce “Sun Pictures” was probably accurate, but not in the production of photographs. The term “Sun Pictures” was misleading because it described accurate drawings using a camera obscura prior to the invention of photography. The 1851 census records Elizabeth Stockdale Wilkinson as a landed proprietress, and her place of birth as Denbighshire. Elizabeth never married, dying at the age of 72 on 24th August 1871 at her home in Queen Street, Bath, Somerset. She remains one of the earliest documented women photographers and a unique part of a highly distinguished scientific heritage. I am indebted to the late Pete James for his introduction to Elizabeth Stockdale Wilkinson, and for providing the information contained within this blog in early 2018. This page is dedicated to his memory. Grateful thanks also to Graham Harrison and Jon Wood for their valuable assistance. Baptism record of 1st January 1800 states “Elizabeth Stockdale, Daughter of William and Elizabeth Wilkinson was born June 17 1799”. Probate, 19th March 1872, proved by James Patrick Muirhead of Haseley Court, Tetsworth, Oxfordshire.